In short: A resilient and utilitarian four-passenger crossover. 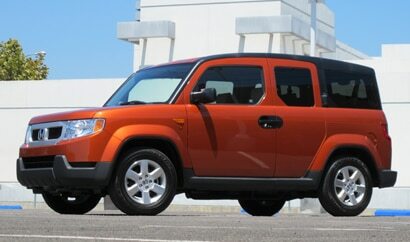 The Honda Element is a robust four-passenger crossover that aims for the basics, offering a boxy, utilitarian-styled body and two convenient clamshell doors. The vehicle’s tough demeanor shows through with its unit-body construction, side-impact door beams, scratch-resistant utility floor and water-resistant FXC seat fabric. Among the other features included with the Element are a 2.4-liter four-cylinder engine, power-assisted brakes, vehicle stability control and highly configurable seating. Our Honda Element EX came fitted with tons of techy treats like Honda's satellite-linked navigation system and a USB audio interface that helped to make long trips a little bit more fun. Carpooling with pooches was also not a problem with our Dog Friendly Honda Element, which adds a built-in kennel, stowable ramp, and even a spill-proof water bowl to this already versatile crossover.